REMEMBER: First-year students are only permitted to take 100-level (junior) courses. Exceptions to this include language courses (i.e. students who have completed Grade 12 French should register in AUFRE 201 and 202). Contact your Admissions Advisor for more information on this. If you are a post-secondary transfer student, you may be permitted to take senior-level (200, 300, or 400-level) courses. We recommend using your ARR to write down all the courses required in your first year. This list should include your Foundation Core requirement (AUIDS 101) and major requirements. Also, if you have major supporting course requirements and courses for your minor, add those as well. If you have not reached 30 credits yet (15 credits each term), you still have room in your class schedule to take additional classes. If you still have space in your schedule, you will want to enrol in courses that fit into the Augustana Core Engagement and/or Knowledge categories. Generally, by choosing a variety of first-year courses that satisfy your interests, you will begin to fill up your Core Engagement and Knowledge credits. If you wish to meet a specific requirement in your first-year, be sure to use the Augustana Course List Tool to learn what courses meet certain categories of the Core (information on how to use this tool can be found below). All Augustana academic awards require students to take a minimum of 27 credits of coursework per year. This will typically be met if at least 9 courses are taken per academic year (5 courses one term and 4 in the other). Note: Augustana students are also eligible for many of the general University of Alberta Academic Scholarships which require a full course load of 30 credits per academic year (5 courses per term). What terms are the courses I need offered in? Now that you know the courses that you need to take, your next step is to determine when each of the courses are offered. Some courses are only offered in the Fall Term, some only in the Winter Term, and others are offered in both terms. The easiest way to find when a class is offered is to use the Augustana Course List Tool. The tool can also be used to help you determine which courses fit in which categories of the Augustana Core. Under the "Course Level" heading, ensure that only the junior (100-level) courses are selected. This will ensure the only courses you see are available 100-level courses. This tool can also be used to find courses offered only in a specific term, or that meet certain Augustana Core criteria. You will want to look to see when the courses required for your program are offered and write them down. Be sure to read the course descriptions for the courses you are interested in. You can view this by clicking on the arrow. Some first-year courses will have pre-requisites or co-requisites at the high school and/or university levels. For example, you will not be permitted to register in AUSOC 103 without first receiving credit for AUSOC 101. Always check the course description in Bear Tracks, the University Calendar, and/or the Augustana Course List Tool. If you are having difficulties using this tool, contact your Admissions Advisor. We are always happy to provide you with guidance. What Course Should I take in the Winter 3-Week Session? By looking at the Augustana Course List Tool, you will notice that there are quite a few courses offered in the Winter 3-week session. Generally, we recommend that you take a course that fulfills a component of the Augustana Core. However, there are certain courses that we recommend that you take depending on your program and/or major. It is important to remember that the style of the 3-week session is an intensive and in-depth course within a shortened time frame. There is little flexibility for missing class times, so ensure you are arriving back on campus in time for the start of the Winter 3-week term. AUIDS 137 - Please consider taking if you are a non-science student looking to complete science credits. This is a Science course specifically designed for students not in a BSc program! Throughout the course, you will learn introductory Biology, Chemistry, and Physics concepts. You do not need to have any science background to take this course! As a result, it is a great way for you to complete the science requirement of the Augustana Core. Please note: this course is only available for students that have less than 6 credits (2 courses) in Biology, Chemistry, Physics, and/or Environmental Studies. This course requires higher reading and writing skills than a typical Science course, so it will allow you to engage with the Sciences while utilizing the skills learned from your non-Science classes. This class is also a good way for non-BSc students to earn credits towards the Knowledge part of the Augustana Core Read how first-year students enjoyed this course. AUECO 102 - Please consider taking if this is a recommended course for your program. If AUECO 102 is a recommended course, please consider taking AUECO 102 in the Winter 3-week session. You must take AUECO 101 in the Fall 11-week session before you are able to take AUECO 102 in the Winter 3-week session. AUPAC courses - Please consider taking if you are a Physical Education major. Physical Activity Classes are only 1 credit each. As a result, if you are interested in taking an AUPAC course in the Winter 3-week session, it is recommended that you take 3 of the offered AUPAC courses (AUPAC 152, 178, 181, 191). Due to the intensive and integrative style of the 3-week courses, it is important to set the goal of attending every class. Missing one class is similar to missing a traditional week of school. Be prepared to engage deeply with your course topic! Be ready to hit the ground, running! You should expect to have readings, papers, or group work after each class. 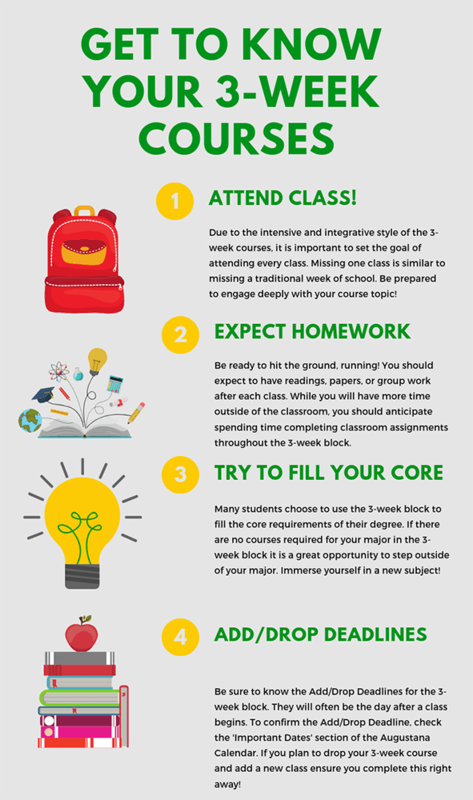 While you will have more time outside of the classroom, you should anticipate spending time completing classroom assignments throughout the 3-week block. Many students choose to use the 3-week block to fill the core requirements of their degree. If there are no courses required for your major in the 3-week block it is a great opportunity to step outside of your major. Immerse yourself in a new subject! Be sure to know the Add/Drop Deadlines for the 3-week block. They will often be the day after a class begins. To confirm the Add/Drop Deadline, check the 'Important Dates' section of the Augustana Calendar. If you plan to drop your 3-week course and add a new class ensure you complete this right away!